Wednesday dawned bright and early and we headed to the airport to catch our flight to the Big Island. We are standing in line to get checked in when Rob drops the big bombshell...he has lost his wallet which contains his driver's license. Without going into great detail, suffice it to say this put a bit of a damper in our efforts to leave Maui. Not only that, it turned out that Tyler had been traveling with a temporary paper license because his permanent license had not yet come in the mail. Alabama apparently had no problem with a temporary Alabama license. Hawaii had a big problem with it, however. So now we had two in our group who were going to have go through extra screening. Ahhh, but that isn't all! Tyler, being sweet, had offered to carry my rolling carry-on bag before he realized he was going to be pulled aside. Now the bag of mine that he was carrying had to be opened up and sorted through by hand. It was a very long airport ordeal! It took us longer to go through security and wait for our plane than it took for the plane to get to the Big Island. But get to the Big Island we did. We got another jeep at Alamo and headed to our hotel, the Waikoloa Hilton. 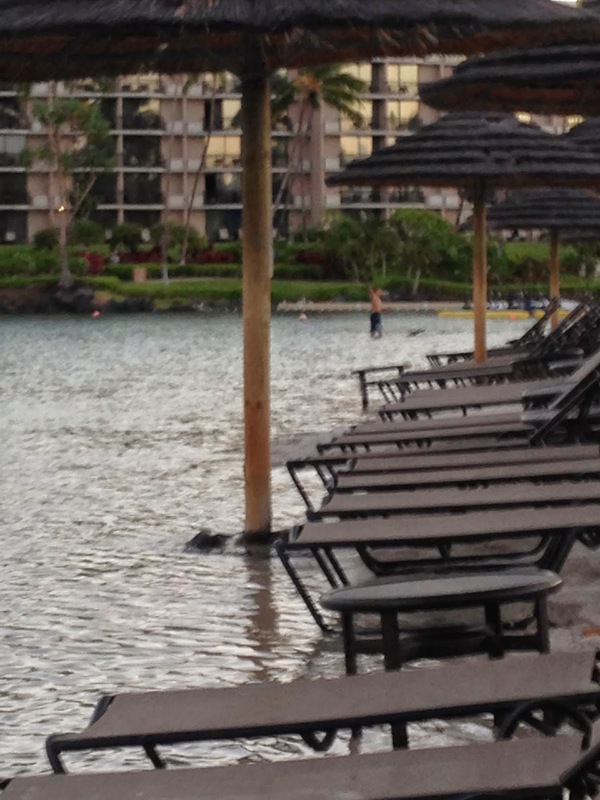 This is a beautiful resort, with pools and lagoons, cabanas and kayaks. It is so sprawling in its 62 oceanfront acres, that it has boats and a tram to get guests from one end of the property to another. Even with these people movers, getting around the property can be quite a workout and plenty confusing. 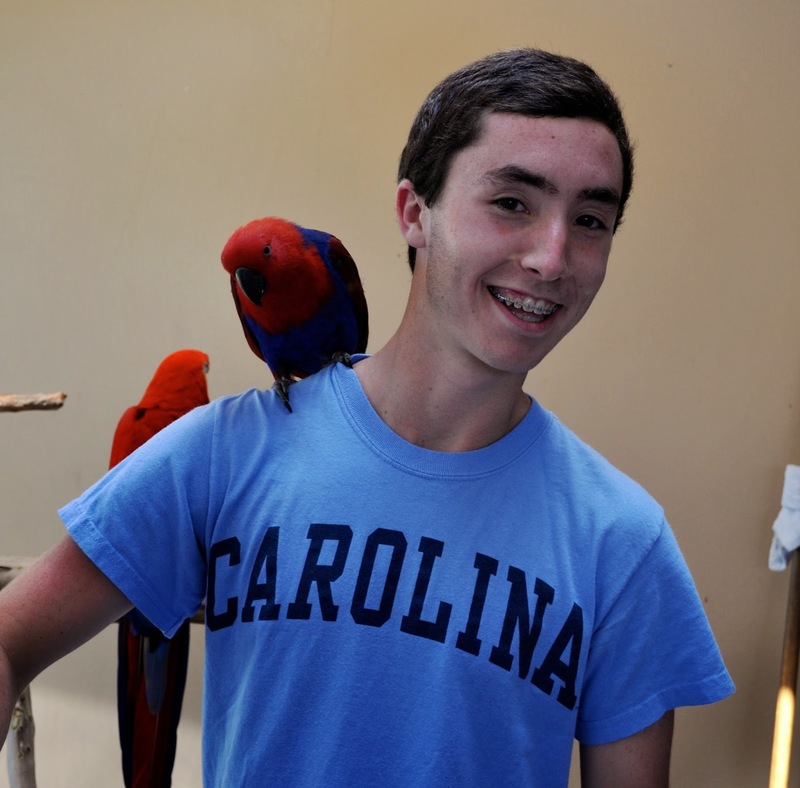 As we were looking around in the lobby, Rob, our family's version of Jack Hanna, found some splendidly colored parrots. He walked over near them and the next thing we knew, one of those big birds had hopped onto his shoulder. Apparently this is a big no no, but it was too late. A lady, apparently in charge of the birds, came rushing over to chastise Rob, give us dirty looks and take the birds away. The birds were so angry to be taken away from their new buddy that they squawked and pitched fits causing everyone in the hotel to stare at us. Oh, yeah! Welcome to the Big Island! We quickly left the lobby, hiding our faces like criminals, found our room and the boys took off to check out the pools. Scott and I drove to a restaurant called The Big Island Grill to grab a bite to eat and see a bit of the island, while I secretly said a prayer that Rob wouldn't be eaten by a shark before we got back. Big Island Grill was a pretty low-key place that had been recommended by the girl at the Alamo office. Unfortunately, I, for some reason, failed to get pictures of our food, possibly because Scott had been asking all week long why we always had to take pictures of our food before we ate it. Anyway, the fish sandwich I had at The Big Island Grill was fresh and good, just like all the seafood we had in Hawaii. We both had a kind of fish called monchong, which was a new fish to us. After we ate, we drove around the island a bit, amazed at the difference between this island and Maui. Everywhere we looked was covered in black lava flows with goats standing on top of them. The next day we got an early start once again. We had reservations with Blue Hawaiian Helicopters to fly over the volcanos in the Ring of Fire tour. We had to drive all the way to the other side of the island (about 2 hours) to the Hilo airport to catch our flight. It was the smoothest helicopter flight I have ever had. We flew over Mauna Loa and Kilauea looking for fissures, glowing lava and rising steam. Unfortunately, there were no lava flows when we were there, but the next week, after we had returned home, the lava apparently found some new cracks and began flowing again. We were pretty bummed about that! The boys were hoping to fly over the equilavent of Mount Vesuvius, so that bit of steam was a bit of a let down. When we got back to the Hilo airport, we were ready for some lunch, so we headed to a sports bar called, Cronies. Cronies occupies a big chunk of real estate at the corner of Waianuenue Avenue and Kamehameha Avenue. The interior is kind of dark even with the big windows. You can't go wrong with fish in Hawaii, so, once again, I had a fish sandwich. It was fresh and good with a yummy tartar sauce. Scott also got a fish sandwich. Tyler got a reuben which he liked very much. It came on a marbled rye and was accompanied by French fries. Rob enjoyed a chicken Caesar salad. It was huge! And, JD decided on fish and chips with a side of onion rings. He liked it, but I tasted it, and it was really more breading than I like. Sports pennants, banners and memorabilia covered the walls of Cronies. We were checking out all the teams, never expecting to see an Auburn banner. But, there it was! In a narrow hallway above a rear exit, right across from the women's restroom! 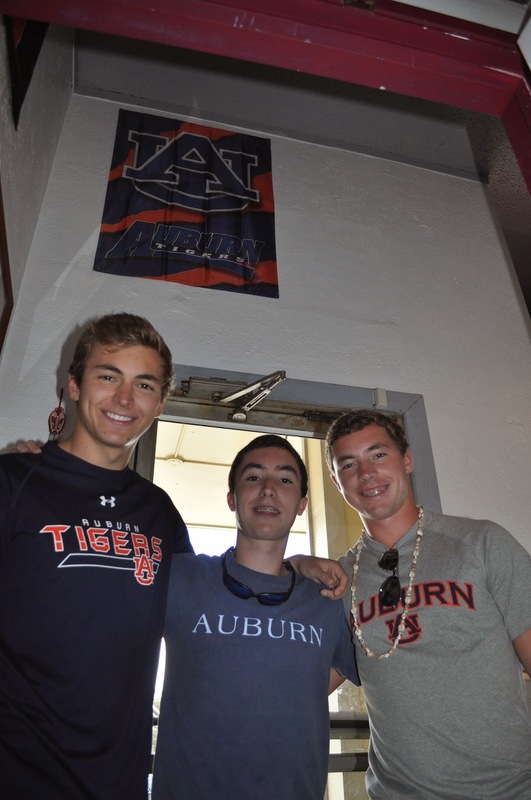 Of course, we had to have a picture of the guys and that banner, since all the boys were wearing their Auburn shirts. We headed hack to get the picture, but the hallway was so narrow, I actually had to open the door to the restroom and squat down in order to shoot up high enough to get both the boys and the banner in the picture. If that wasn't bad enough, a lady came by wanting to go into the restroom. When she saw us in that awkward position, she said, "I'll come back later!" We assured her we would get out of her way, but she said she wasn't too sure about going to a restroom where people were taking pictures! By this time the boys were hysterical! We got the picture and ran back to our table in tears from laughing so hard. Always proud of our team! In the interest of full disclosure and for the benefit of all my Alabama friends out there, we were feeling pretty smug about the fact that there was an AU banner and no Alabama one. After we paid the bill and started out the door, we saw it. Alabama's banner was right by the front door. No squatting down in the ladies' restroom to get a picture of it! I was a bit miffed! 3 Sporty Yums UP! War Eagle!